Why write about books when there are already more books about books than can be read in a lifetime? Because I am going to write about my books and these have never been written about before. 'Ah', you may say, 'Yes, they have'. But, actually, no - my books and their relationship with me have never been written about. For, example, my copy of 'Jane Eyre' is not the same as your copy; you see my copy is intricately bound up with childhood terrors concerning Bertha Mason, when we were allowed to watch the 1956 series on TV, family visits to Haworth to marvel at the 'Little Books' and serious attempts at unravelling the social significance of The Madwoman In The Attic. Your 'Jane Eyre' can similarly only be interpreted in the context of your experiences and influences. So, that is in way of an apology, or perhaps an excuse. It all began with the bookcase. Looking up, I see the bookcase in the corner of our present lounge. It is of the type known as Wernicke, sold, I believe under the Globe Wernicke brand. As a child, this bookcase was my introduction to the world of books, or, more specifically to the concept of a collection of books. 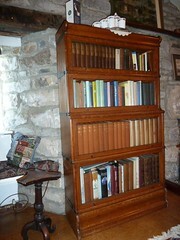 The bookcase had four shelves, each with its own up and over hinged door, lifted by two brass knobs on the front. It was only later that the true elegance of the design was revealed when first I moved the bookcase from my parents' home to our first house in Hampshire. This is the ease with which each shelf lifts off as a single 'box' when the bookcase is dismantled. But I will return to the subject of bookcases later; a very important subject since it is my belief that a collection of books properly shelved forms an entity independent of the sum of the books as individual objects. But first I must return to that bookcase of childhood, since it is here that the story starts. Picture a large Cheshire farmhouse, brick built and, to a child, steeped in legend and mystery. In the farmhouse was a parlour, this being the room that the family lived in, rather than the austere drawing room, reserved for special occasions. In the parlour was a fireplace and a sideboard, chairs and a settee. In the corner next to the fireplace was the bookcase, where behind the glass doors was my father's collection, with a few stray school prizes belonging to my mother. By now a picture is emerging and it is probably simple to deduce that, after the usual childhood fare, the first author who I consciously sought out (thank you Bury Public Library) was G A Henty. 'Jack Archer', 'With Lee in Virginia', 'Redskin and Cowboy' - these were a staple fare, together with,of course, William and Jennings. There were also several of my mother's books, mostly school prizes and invariably of a sentimental or self-improving nature. Thus I was introduced to the world of girls' schools via 'Dauntless Patty' and of family bereavement via 'Kathleen' by one Agnes Giberne, with chapters titled 'Shadows in the Home' and 'Dark Days', enough to soften the heart of the most recalcritant 8 year old. However, I am sure that it is to these contrasting sub-collections in this cherished bookcase that I can explain some of the byways of book collecting that I subsequently followed. In the next part of the story, I will fast forward 60 years to the present contents of the bookcase.